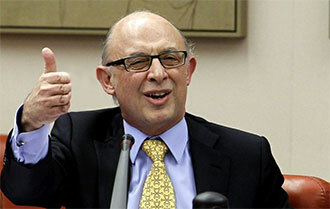 The Spanish Finance Minister, Cristóbal Montoro, announced on Wednesday that the Catalan Government will finally have to meet a 1.58% deficit target in 2013, after several months of talks. The figure is far below the expectations of the Catalan Government which had previously stated that any figure below 1.8% was “totally insufficient” and was pressuring for a 2.1% deficit target. Furthermore, Barcelona’s Chamber of Commerce stated today that no deficit target below 2% would be “fair”. The 1.58% deficit target finally imposed on the Catalan Government by the Spanish Executive represents €2.6 billion of further budget cuts compared to last year’s budget, which ended with a 1.96% deficit. The Catalan Finance Minister, Andreu Mas-Colell, accused the Spanish Government of “asphyxiating” the Autonomous Communities. The former Harvard Professor made these accusations after knowing that, in 2014, the Spanish Government will fund the Catalan Executive with €500 fewer million than in 2013, although revenue from taxation is expected to increase following an improvement of the economic situation. Furthermore, once in the Fiscal and Financial Policy Council (CPFF) meeting (where the Spanish Government announced the new deficit targets for the Autonomous Communities) Mas-Colell denounced that the Spanish Executive was “keeping for itself the greatest share of the deficit pie”, while it is only responsible for 50% of Spain’s public spending. The Spanish Government is keeping for itself a deficit target of 5.2% for 2013 and most of the flexibility allowed by the European Union, which authorised a 6.5% deficit for Spain’s total public sector. Meanwhile, the Autonomous Communities have a deficit target 4 times stricter, although they manage 36% of Spain’s total public spending and basic services such as healthcare and education. Montoro confirmed at the CPFF meeting what had been leaked weeks ago, that in 2013 Spain’s Autonomous Communities will have different deficit targets, although their average will be 1.3%. According to Mas-Colell, the way deficit targets have been split between different government levels and Autonomous Communities is “a mockery”. Catalonia, Asturias, Canarias and even Madrid – which like the Spanish Government is also run by the People’s Party – rejected the distribution. However, Madrid rejected because it was against setting different target levels for the regional governments. On top of this, Montoro announced that in 2014 the Autonomous Communities will all have to meet the same deficit target, which will be 1%, while the Spanish Government’s will be 4.8%. The Catalan Left-Wing Independence Party (ERC) stated the Spanish Government’s attitude towards Catalonia was “grotesque”, particularly because Catalans are obliged “to beg for a loan to recover a fraction of the public resources that each year leave Catalonia”. The ERC was referring to the money paid by Catalan tax payers that leaves Catalonia and goes to pay for investments and services in the rest of Spain, an amount known as ‘fiscal deficit’. According to the latest studies, in the last 25 years Catalonia has been obliged to donate an average of 8.5% of its GDP, which represented €16.5 billion per year in 2011. If this fiscal deficit was halved, the Catalan Government would show a budget surplus and would be reducing its debt. Instead, the Catalan public services are under-budgeted and Catalonia’s fiscal pressure is one of the highest in Spain.